SVV Red Star Brussels (full name: Socialistische Voetbalvereniging Red Star Brussels, abbreviation RSB) is a football team in Belgium. The team currently plays in league V.176 of the Belgian Competition. Since 2013, they have a second team in Suriname, Rode Ster Paramaribo, and since 2017 a third team in Tunisia that plays in Hattrick International: Red Star Tunis. The current team number was received in September 2016, after a restart when the former team was stopped on Hattrick earlier that year. SVV Red Star Brussels started in Hattrick on 18-08-2009. The team was founded by a group of socialists in the city of Ghent, who wanted to combine their political activity with their passion for football. Lunacharsky was elected as manager for the team. The team was first officialy named SVV Red Star Gent. When RSG was founded (as Rode Ster Gent, the team played only the last round of Global Season 39 in competition IX.1432. The match against SKDH United ended in a 2-2 draw, placing RSG fifth in the competition. SVV Red Star Brussels (then: Red Star Gent started her first full season on September 13th 2009 against United KV. RSG won easily 3-0, and immediatly showed their claims on the title for the season. However, because of two defeats against human competitor SKDH United on the second and before last matchday, RSG remained on the second position through the whole competition. Joël Crahay became topscorer with 13 goals. Red Star Brussels played in division VIII.255 starting from Season 41. They performed rather well, and where able to take the first position in the competition after the seventh matchday. The team promoted to Division VII. By the end of the season, it became clear that a majority of the new supporters came from Brussels and the Walloon area, and that the team's political profile attracted large layers of foreign supporters. Therefore, the team decided to move to the Brussels town of Elsene by the end of the Season. The team started in Division VII.578, starting from Season 42. Again, they immediatly promoted that season by again winning the competition. They arrived in competition VI.449 in Season 43, and suprisingly reached the second position in the classement after an excellent season, where RSB dominated the league for most of the season. The second season in League VI.449, RSB stayed in the half of the classement, and ended fourth. The team would still stay in VI.449 for three more seasons, after it promoted to the fifth division, playing in Division V.189. 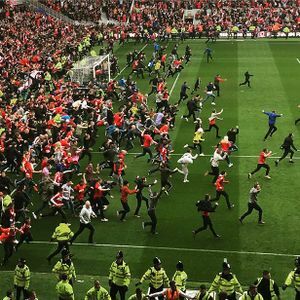 Pitch invasion in the final game against Skunk Anansie in Season 66, when promotion to 5th division was ensured. In League V.189, it became soon clear that the fifth division of the Belgian championship was much more difficult then the sixth division, and that the team didn't have the strenght to guarantee the maintain in this competition. Despite some good results earlier in Season 47, the team was condemned to a degradation playoff later in the season, in which it lost 1-3 against Pickass United!. The team fell back to division six. The team would remain in sixth division for another 3 seasons, although winning the league in the last two occasions. The first time, they - consciountly - didn't promote back to fifth division, the second time, in Season 50, they overclassed their competition so much, that they automatically promoted, and ended up in League V.231. This time, the promotion was much more stable, and in the very first year in 5th, a third place in the league was obtained. Early 2016, then SVV Red Star Brussels was closed, after a period of inactivity from manager User:Lunacharsky. On September 18th 2016, the team was refounded as SVV Red Star Gent, and started Season 63. After one season, they returned to Brussels, and were renamed SVV Red Star Brussels. The team played in 6th division for four consecutive seasons, reaching the fourth, third and second position respectively. During this fourth season, Season 66, they promoted to fifth division for the first time in 7 seasons. This was widely celebrated by the supporters through a pitch invasion. The team remained in 5th division for the next four seasons. During Season 67, the team decided to become a homegrown team over the coming years. The team will be focussing mainly on training its own youth recruits, and in 19 seasons, the whole A-side will be solely composed of players that are originally from the own youth academy. The current name "Red Star Brussels" was introduced in January 2017, when the team was recreated in Brussels. The name was adopted originally on September 15th 2009, when a poll amongst supporters decided to adopt "SVV Red Star Gent" as the official name of the team. Other possibilities where "Rode Ster Gent" or "Red Star Ghent". The supporters decided to take an international stand by choosing Red Star in the name of team, thus making the meaning of this part of name understandable for international supporters. They also choose to take up the official local name of the city where the team was founded: Gent (instead of Ghent in English). Before that day, the team was first called "Rode Ster Gent". Because the Belgian Season 27 had already started, the new official name came into effect during the midseason between Season 27 and Season 28. Later, from April 2010 to early 2016, the team was called "SVV Red Star Brussels". After the recreation in September 2016, the team was named SVV Red Star Gent for one season, after wich they attained their current name SVV Red Star Brussels. 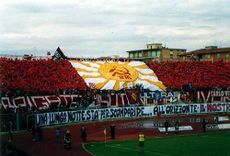 The official slogan of the team is "Nixor, Concordia, Socialisma", or "Struggle, Solidarity, Socialism". It is also the slogan of the trotskyist party LSP, of which most supporters are members. The slogan expresses the sportive rivalry and competition between football teams, while on the same time stressing on the class unity between all workers of different teams, or like President Jan Verhamme of the supporters' association put it: "Football rivalry is for one evening, class solidarity is forever"
The Red Star Brussels logo is a red shield, showing a red star in the middle, and surrounded by the rose in the fist of socialism. The shield is surrouned with banners citing the name of the team and the slogan. It replaces the old logo of a red star on a beige shield, surrounded by text banners citing the name of the team and the slogan. The original logo was developed by fumiasty, a Polish player who used to manage Niezatapialne Pasikoniki (1825862). The logo was adapted to the new name Red Star Brussels by Canadian player Oshawa, who manages Oshawa Ogre (107171), during the period the team played in Brussels. Staff, players and supporters of Red Star Brussels are eternally grateful for the professional logo. In Season 70, Red Star Brussels used shirts that were inspired on the shirts used by R. Antwerp FC in the season 2017-18, the year they played in first league again after years in the lower tiers of the Belgian competition. A history of the Red Star Brussels kits can be found at this page. Red Star Brussels fans during the first ever official competition match at home against United KV on September 13th, 2009. 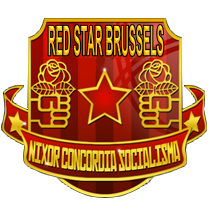 The official fan club of Red Star Brussels is called "Revolutionair Socialisten" (or "Revolutionary Socialists" in English). Most of the members come from working-class neighbourhoods in Ghent, Brussels or the rest of Belgium, and some of them are marxist students from Ghent University. The fanclub currently has over 2 100 members. Red Star Brussels has an increasing number of international supporters. RSB supporters are well known socialists, many are members of political parties like the trotskyist LSP. They often fraternise with fanclubs from other socialist teams, like Trotskijs Kämpar in Sweden or Leninska Zvezda in Bulgaria. The "Revolutionair Socialisten" are known for their militant antiracist, antisexist and antidiscrimination attitude. Red Star Brussels currently has 15 Hattrick Users as an official supporter. Starting from Season 51, Red Star Brussels elected every year a player of the season. Hereunder an overview of the winners of this honory prize. This page was last edited on 3 March 2019, at 14:59.